Billings, MT– Imagine being in high school and participating with professional athletes in a huge venue, in front of thousands of people. For the top two high school rodeo athletes in each event, they don’t have to imagine, they get to live it Thursday, October 20 at the 2016 NILE. “All of us involved with the NILE are excited to invite these future superstars to join us in Billings for the second annual NILE High School Showcase,’ said NILE General Manager, Jennifer Boka. The NILE is proud to highlight kids and their pursuit of their dreams at this year’s High School Rodeo Showcase. During the fall season young rodeo athletes vied for winnings and top points for a chance to run under the lights at the Metra. Although they won’t be competing against the professional athletes, this experience is great practice for future endeavors. Each event will feature top rodeo athletes from around the country. The final two rides in each event will feature the top two high school competitors. Graduating on to the next level, the Thursday night NILE rodeo is the annual Cat/Griz Shoot Out. 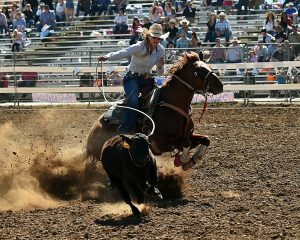 A themed rodeo that pits the professionals against each other representing either the MSU Bobcats or UM Grizzlies. The contestants are designated to a team and at the end of the night whichever team performed best that school’s rodeo program receives scholarship money. Support, encourage, and cheer on the next generation of rodeo athletes at the Cat/Griz Shoot Out featuring the High School Rodeo Showcase Thursday, October 20 at the NILE!